Chris Reed (who plays anything he can get his hands on and lead vocals): Was born in Los Angeles but wasn�t raised there. He corrected this oversight shortly before he turned 18 and returned to Los Angeles to attend UCLA and get his degree in music. The son of an Animator and a Cellist and the grandson of a man signed to Capital Records, he knew from an early age that music was his calling. His first musical instrument was the saxophone, but he moved on to piano and then guitar before graduating high school. While in college he helped form the band Blue Shift with Lee Emanuel and Jason Edwards, but the lack of a drummer gave them few performing opportunities and so Chris (on guitar and vocals) moved on to form the legendary LA club band ASK, with Ed Lee (keyboards), Kevin Donville (bass and lead vocals) and a series of drummers before finally landing T.J. Klassen. The famous story in Los Angeles about a band buying a drink for every customer at a gig isn�t about ASK, but they did do it second because both they and the first band (Mercy Beat) had the same manager. ASK was a successful band with many gigs around the Los Angeles area, label interest and a hit single on local radio called �Saying Goodbye to L.A.� However, Lead Vocalist Kevin Donville decided to take his life in another direction and the band broke up in 1989, leaving Chris to begin work on a solo album. He had written a novel about a rock star whose name is Jim Christopher, who was based on a drinking buddy of his who agreed to let him use his name in exchange for paying his bar tab (there was also a bet involved � see Jim�s profile). Because Chris was getting flack in the industry for having the same name as the lead singer of Red Lorry Yellow Lorry (Google them � they were big at the time) they hatched a scheme that would have Chris record his album using Jim�s name as his own stage name. The album, recorded for all of $700 (while another big name artist using the same studio spent $100,000) and done mostly in single takes, features Chris on every instrument (although T.J. Klassen was called in to do the drums on one track) and features 12-string guitar on almost every song, but only 3 ballads on the whole album. My World � Welcome To It was that album and the first single, �Favorite Partner�, was played on radio stations throughout North America and Asia and became a hit. �Patience� from the same album was played on National Public Radio, while �Defending Luther� was picked up for a movie soundtrack. My World � Welcome To It is now available on iTunes/Rhapsody under the current band name, Chris Reed and the Anime Raiders. Thanks to the sales of what was essentially a self-made and distributed album, Chris was signed to a record deal (name withheld due to settlement agreement) to produce a new album, to be called �The Jack Acid Society�. The album, alas, was never finished. Chris got into a fight with the record label over ownership rights of the songs and walked away from the deal. Fortunately, a few of these songs were recorded before the deal was signed and wound up on the next album. In 1996 Chris (still calling himself Jim Christopher) signed with internet record label J-Bird Records as a charter artist and released �Fiction�, again playing all the instruments himself and keeping the ownership rights to his own songs. While satisfied with the album, radio play was weak at best and the album floundered. Only the song �Tuesday Morning� garnered much radio play, although both �Screw Dying� and �Piece of My Soul� were also released as singles. Kevin Donville, the former lead singer of ASK, wrote the song "Re-Creation" which is featured on this collection. This album has also been released on iTunes/Rhapsody under the current band name. At this point, Chris decided to take a step back and re-examine how his music was distributed and released. He was making a decent living as a composer of music and was no longer interested in the �rock star� idea. His old drinking buddy Jim had become a respectable guitarist in his own right, and after being released from his contract with J-Bird he decided to take his own name back and put together a band, vowing never to be signed to a record label again. This band would be different � they wouldn�t tour and wouldn�t even need to live in the same city. No one would need to know what they look like. They would simply record together. All that would matter is the music, which would have to stand or fall on its own. Chris decided to name the band after one of his hobbies, and Jim joined up. After recruiting the old gang from Blue Shift and finding a drummer from Japan, they spent three years working on the double album �The Long Goodbye� (2004). The album included a piano sonata, a small rock-opera, alternative rock, a series of remakes, some pop songs, a hit internet single (�Kauro-chan�), one track recorded at one of the band�s very rare live gigs, and runs just under 2 hours and 40 minutes. This time former ASK member Ed Lee contributed the song "Night Escape". The cover art was done by a group of cartoonists that Chris has met over the years. For a time, the Guinness book of records people were contemplating adding the album as the longest (in time duration) studio album of all time, but ultimately decided against it. A mercifully shorter version is available at iTunes/Rhapsody. In 2006 Chris recorded 2 new songs and in an attempt to tide people over while he recovered from a serious illness he put them onto a compilation package called No Hits � 15 Years of Chris Reed and the Anime Raiders. This package is not available through iTunes/Rhapsody, but only through this website and for much less money than you would pay through iTunes/Rhapsody/etc. � all 15 songs for only $2.00 U.S. The newest album, eleven/eleven, bacame available on his birthday in 2008. Recorded as a response to the changes in the world since 2001, it features songs about 9/11, New Orleans, politicians, and how shamefully we treat veterans in the United States, as well as some old-fashioned rock and roll. Chris lives in San Francisco with his wife, 2 children, a cat, and a lifetime of stories you wouldn�t believe if he told them to you. Jim Christopher (guitars, vocals): Was born and raised on a vineyard just outside of Rutherford, California. Gaining an early tolerance for alcohol and having an abundance of funds, Jim began working his way towards Southern California, bar-hopping his way down the state until he got to Hermosa Beach, where he first met Chris. They played darts and Jim won, the loser paying the bar tab. Chris (now bankrupted but with material for his novel) and Jim became friends. Jim lives in Hermosa Beach (he really liked that bar) with his girlfriend and his amazingly robust liver. He can occasionally be found on warm evenings at the beach playing his guitar or flying a kite with the Mona Lisa embossed upon it at various beaches throughout the world. Jason Edwards (bass, vocals): Was born in Manitoba, Canada although he�s an American Citizen now. He is married, with 3 children, and lives in a fairly ritzy neighborhood in Southern California. Jason isn�t his real name though � the name comes from an old joke between Jason and Chris and neither one of them would explain it to the webmaster here. Jason is in fact an actor, one that you might recognize, but both he and Chris agree that they don�t want that fact to overshadow what the band does, and so the pseudonym. He played guitar for Blue Shift, but switched to bass because �he loves the bottom sound� and admires the heck out of Donald �Duck� Dunn. 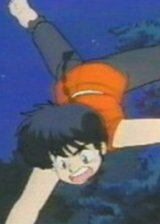 Yeah, that's really a picture of Ranma. Seemed appropriate. Lee Emanuel (keyboards, vocals): Was born in Oakland, CA, the son of immigrants from south-east Asia. The other member of the Animeraiders who came from Blue Shift lives the furthest away, in Manila, The Philippines. He went to UCLA at the same time Chris did, which is where they met, but after the band split he began working on projects that he isn�t allowed to talk about with us civilians. He moved to Manila in the mid 1990s for work and has lived there ever since, occasionally returning to the U.S. to play music with his old buddies and say hi to the rest of his family. He is the only member of the band who does not speak Japanese, although the rest of the members of the band are pressuring him. The picture is from the great anime/manga Touch. Fujii Kyousuke (drums, percussion, samples): Was made in Osaka, Japan. He lived in Southern California while attending college, but moved back to Japan where he lives to this day. A true Otaku, Kyousuke joined the Animeraiders after an audition that was conducted over the internet and took three days to complete. By day he is a Salaryman but he is doing well enough that he can afford a house with decent room for his drum kit. He once competed in a game show that required him to scale a wall in his stalking feet, dodge heavy objects, and lift a 200 lb. wall. This picture comes from the anime 3x3 Eyes, at Kyousuke's request. Chris Reed and the Anime Raiders: All songs are written and/or selected by Chris Reed, who also does all the arrangements. He records simple demos of the songs and sends them to the other members of the band over the internet, who in turn play parts and offer suggestions about what is to be played on the song. Once the parts are fully settled, Chris records a reference track and shoots everything to Kyousuke, who records the drums, sending them back. Chris then works out who is going to play the remaining tracks, and whether or not any additional percussion will need to be added. Conversations then take place via chat/irc about who will play what part and how the arrangements will flow. Jason is usually the next person to record his parts, based upon what Kyousuke has already played. Lee, Chris, and Jim will then use the resulting mix of bass and drums to do their parts, which are often re-done depending upon how different sounds and concepts work together. Occasionally Kyousuke will re-record some of the drum parts and Chris will edit them. Once everything is all together Chris will produce a rough mix and then begin work on the vocals, often writing out the individual vocal parts and sending them to each member as sheet music. Once the vocals are done Chris then mixes and produces all of the parts into the final mix. Voila, a song! Everyone agrees that the brains behind the outfit, sweetheart, is Chris himself. So any adulations or blame you should lay at his feet. The band does not tour, but Chris has been known to hit the road with other musicians to play the music from time to time. In the years that the band has been together, they have played only 4 live gigs together, so yes, all 5 have been in the same place at the same time a few times. Chris is the only member of the band who grants in person interviews, but he has been known to be snarky about them thanks to a misquote from the Oakland Tribune while promoting �Fiction�. For a press interview, you are welcome to click here to make a request through our management - but don't change the subject line. Heh heh heh. Oh, one last thing that we're adding because many people ask - why do we call ourselves the "Anime Raiders" if we don't play Anime music? Well, in case you haven't guessed it yet, we're all anime nuts. Otaku, in the native language. We watch, explore, talk about and generally live for good animation. Chris is the son of an animator and has been watching this stuff all his life, and the rest have fallen under his evil spell. Also, Chris incorporated under that name back in the 1980s when he was doing freelance work in the television industry to bring Japanese Animation to the United States. There are a few shows you might have heard of (and no, we're not dropping names) that he had a direct role in getting the licenses for.